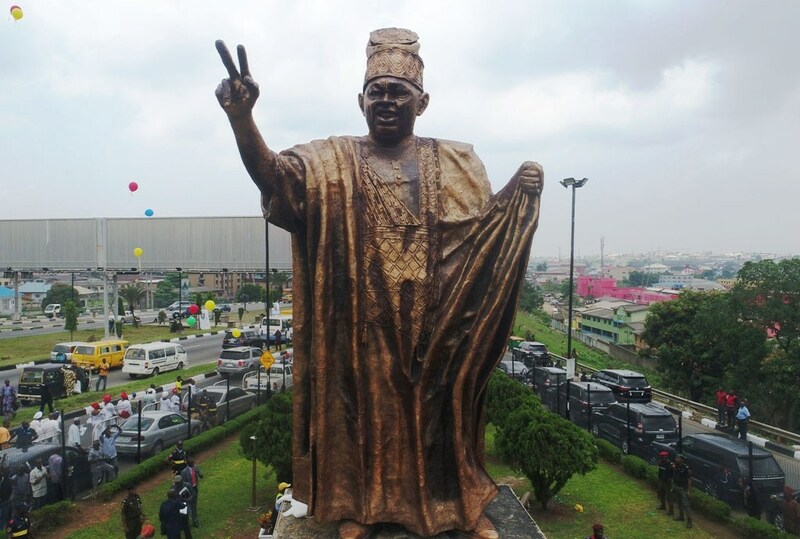 The Lagos State Government has unveiled on Tuesday, a statue of the late politician, Moshood Kashimawo Olawale Abiola, as part of activities to mark the June 12 celebrations. The date which has remained synonymous with Abiola, following his efforts in the fight for Nigeria’s freedom and democracy, has been celebrated annually across states in the country for the past 25 years. Described as the freest and fairest election in the nation’s history, this year’s celebration of the day was, however, symbolic. President Muhammadu Buhari officially conferred an award of the Grand Commander of the Federal Republic (GCFR) on the presumed winner of the 1993 presidential election, Mashood Kashimawo Olawale (MKO) Abiola posthumously, while his Vice, Ambassador Baba Gana Kingibe and Gani Fawehinmi (SAN) were conferred with Grand Commander of the Order of Niger (GCON) respectively. Across some states, the day was marked as a public holiday in memory of Mr Abiola. In Lagos state, a lecture as well as the unveiling of the statue which is situated at the Ojota area of Lagos, were one of the highlights of the celebration. Among those present at the unveiling were the Lagos State Governor, Mr Akinwunmi Ambode, his wife, Bolanle, wife of late Chief M.K.O Abiola, Dr Doyinsola Abiola; Chairman, June 12 Coalition, Comrade Linus Okoroji; and Deputy Governor, Dr (Mrs) Oluranti Adebule. Others were former Deputy Governor of Lagos State, Otunba Femi Pedro and children of the late businessman.